Flower gardens have long been favourite motifs for painters. Long before the Impressionists, artists have painted flowers for their exuberant colour and varied textures. But flower gardens have, over much of that time, been the preserve of the rich. Rural cottages might have fronted a display of semi-wild flowers, but the serious garden has been devoted primarily to vegetables, which pass through the kitchen and onto the table to feed the family. 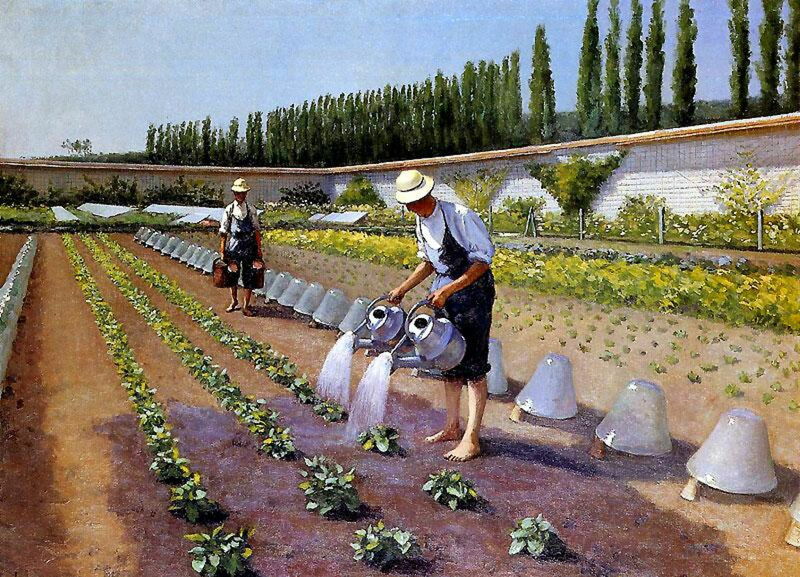 This article looks at some paintings of vegetable gardens: far less glamorous, occasionally quite exotic, and essential to survival. Vegetables have, of course, been frequently included in still life paintings. Some of Chardin’s appear to explain how to make a good vegetable soup, for instance. Charles Demuth (1883–1935), Eggplant (c 1922-23), watercolour over graphite pencil underdrawing on medium-weight medium-textured off-white wove paper, 12.1 x 18.1 cm, The Phillips Collection, Washington, DC. Wikimedia Commons. 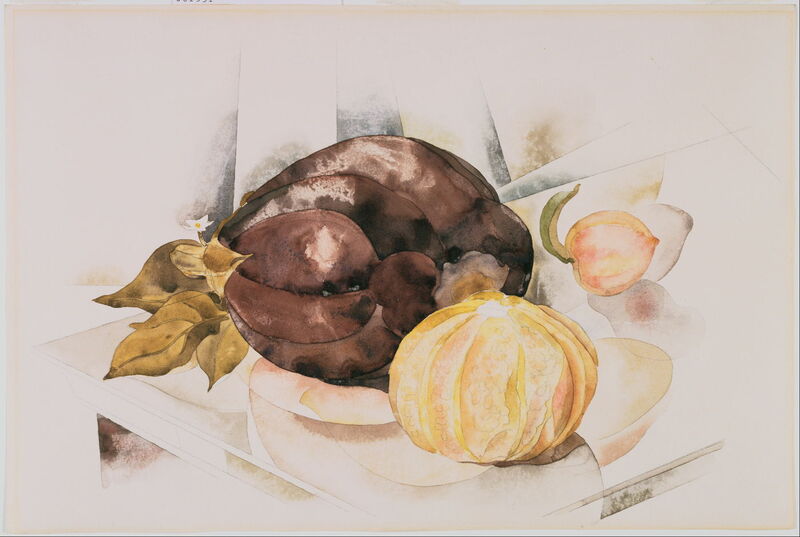 Among his many flower paintings, Charles Demuth also painted fruit and vegetables, of which the Eggplant (c 1922-23), or aubergine, was a clear favourite. As with asparagus, another favourite in still life paintings, few families sit down to enjoy such special vegetables. 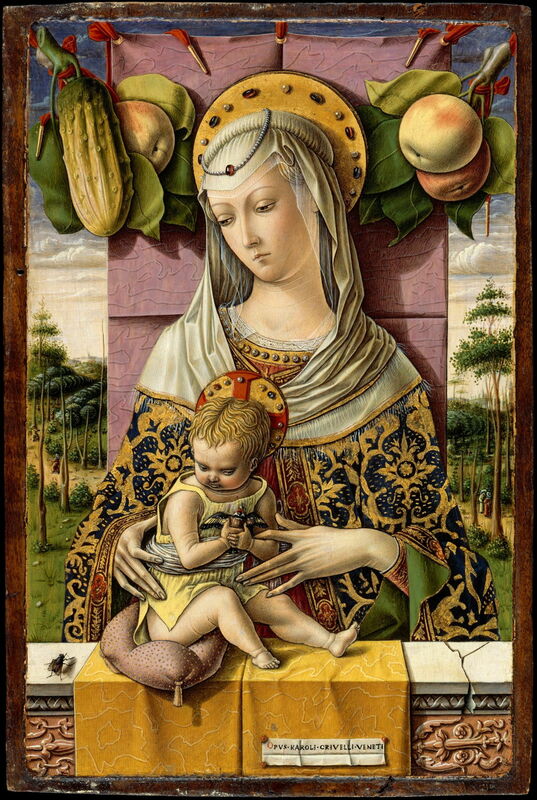 Several artists have had peccadillos for particular vegetables: for Carlo Crivelli, it was cucumbers, with which he decorated his many otherwise fairly conventional paintings of the Virgin and Child. There have been plenty, though, who have made successful motifs from the vegetable garden, most particularly during the nineteenth century. 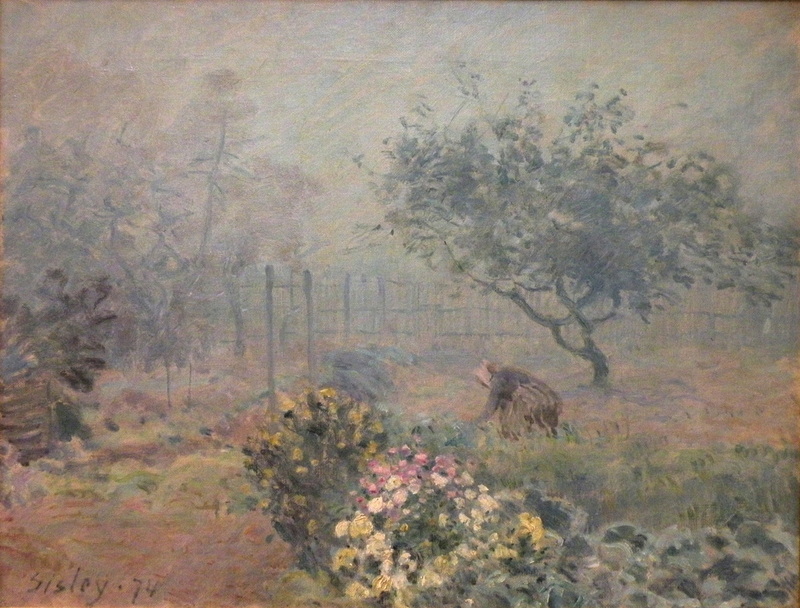 Sisley’s fog-cloaked flowerbed in the foreground is a small patch of colour in this garden. The woman working away is not tending her nasturtiums, but toiling away at what will, in a few months time, be carefully prepared and cooked in her kitchen. 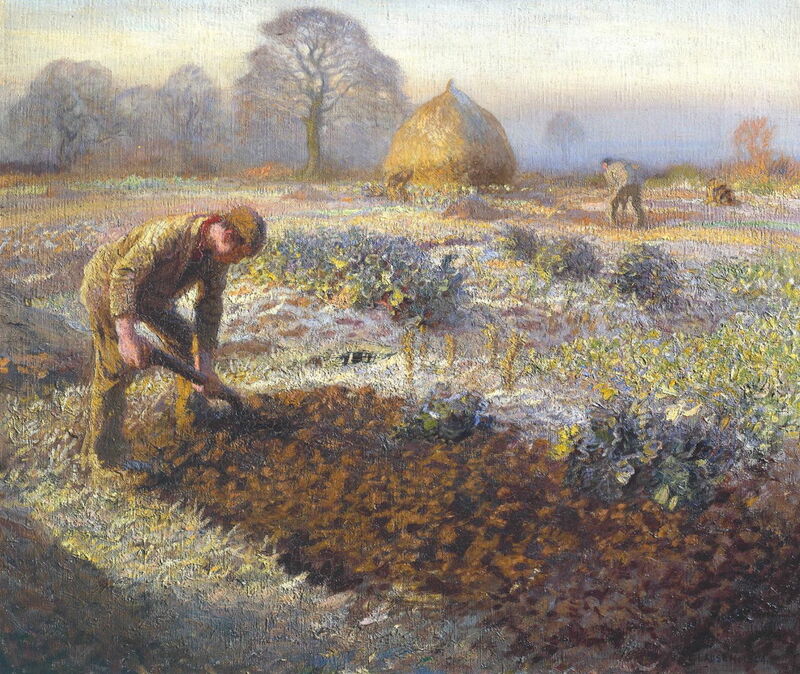 George Clausen’s gardeners are preparing the soil on a frosty morning in March. As they live in a town, they have to work surrogate plots in allotments, small portions of land unsuitable for dwellings, or (in this case) divided from fields at the edge of the town. For many living in towns and cities, a trip to the family allotment was the closest they would get to going to the country – a brief retreat to escape the concrete and tarmac, and dream of living in more pastoral places. Even small allotments were often decisive to a family’s food supply. Gustave Caillebotte (1848–1894), The Gardeners (1875), further details not known. Wikimedia Commons. Whereas Clausen enjoyed his gardening, for Gustave Caillebotte it became his life, an obsession. He painted the large vegetable gardens which fed the estates of the rich, as in The Gardeners (1875). Gustave Caillebotte (1848–1894), The Kitchen Garden, Petit Gennevilliers (1882), oil on canvas, 66 x 81 cm, Private Collection. Wikimedia Commons. In 1888, when he moved out to his modest estate at Petit-Gennevilliers near Argenteuil, Caillebotte almost stopped painting to free up time for The Kitchen Garden, Petit Gennevilliers (1882), as well as his flowers and other garden landscapes. 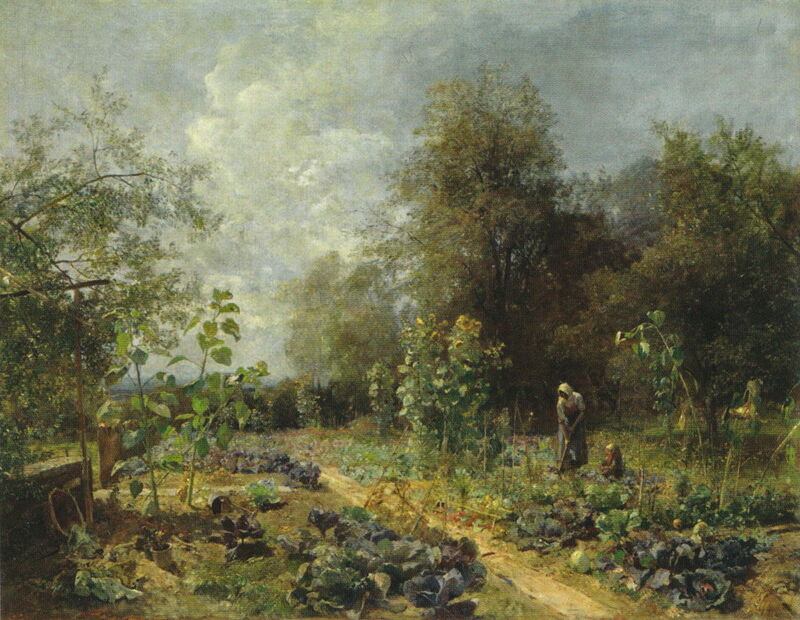 Emil Jakob Schindler (1842–1892), Vegetable garden in Plankenberg in September (1885), media and dimensions not known, Staatsgemäldesammlungen, Munich, Germany. Wikimedia Commons. 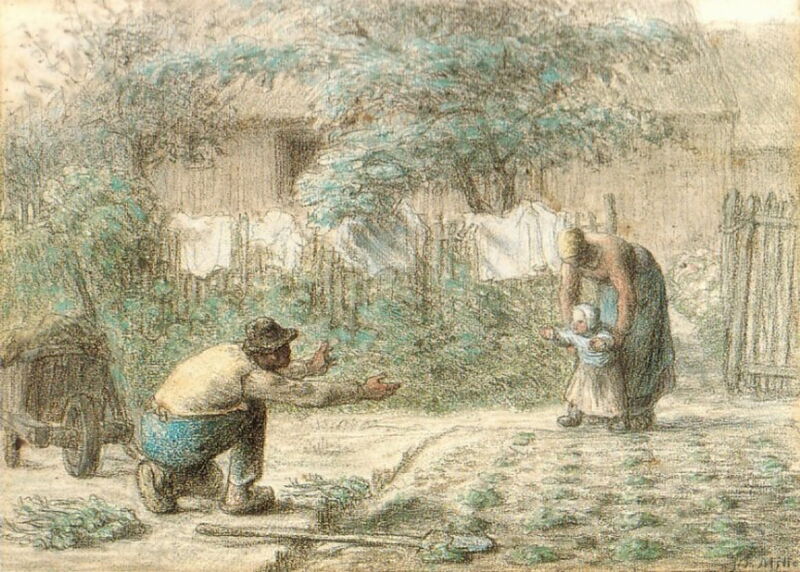 Back in the more everyday, Emil Jakob Schindler shows a more typical rural Vegetable garden in Plankenberg in September (1885). In the more extreme climates of the Nordic countries, vegetable gardens remained essential to nutrition and life. 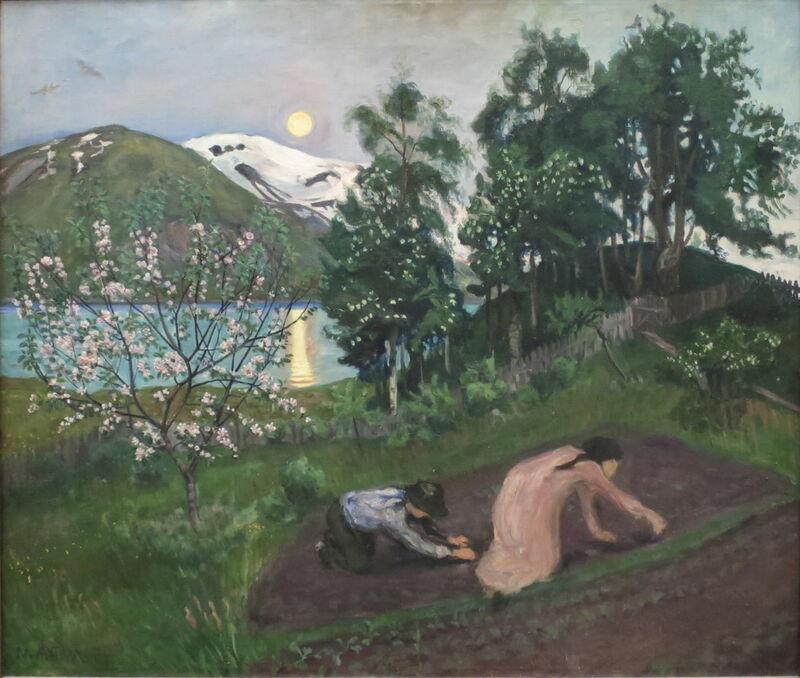 Nikolai Astrup shows a couple probably sowing their small patch in western Norway on A Night in Spring (1909). 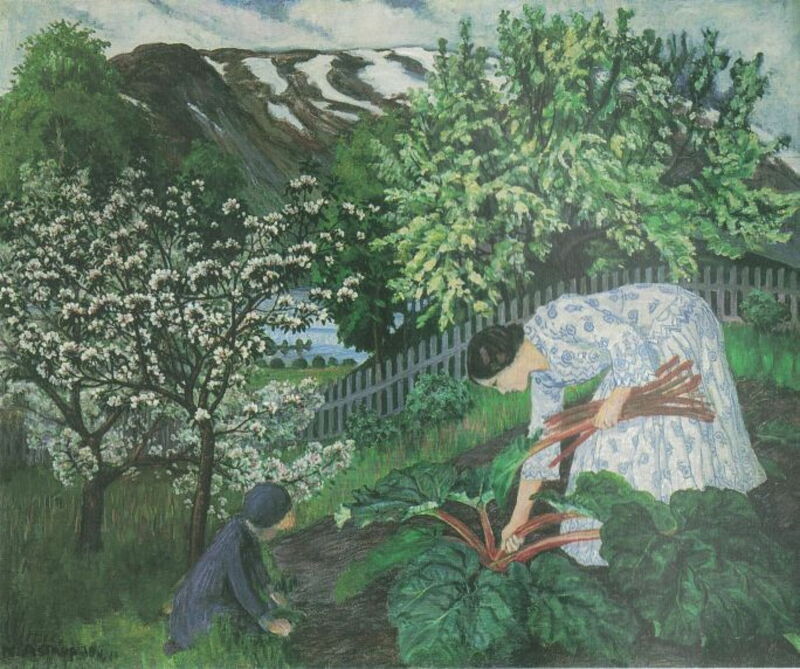 Then late in the summer, they come to harvest that most unglamorous of crops, Rhubarb (1911). Lovis Corinth (1858–1925), Walchensee, Vegetable Garden (1924), oil on canvas, 70 × 90 cm, Private collection. Wikimedia Commons. 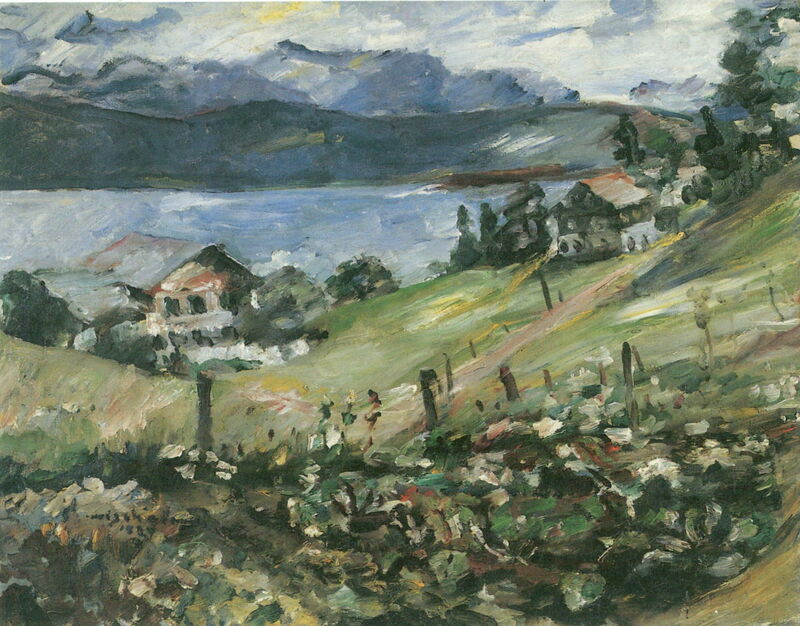 Lovis Corinth found a vegetable garden beside Walchensee, up in the Bavarian Alps, which he painted in 1924, just a year before his death. The production of vegetables was also more organised across villages and small communities, which used larger areas and fields to grow sufficient to subsist, and maybe even a surplus to barter or sell. Asai Chū (1856–1907), Spring Ridge 春畝 浅井忠筆 (1889), oil on canvas, 84 × 102.5 cm, Tokyo National Museum 東京国立博物館 Tokyo, Japan. Wikimedia Commons. 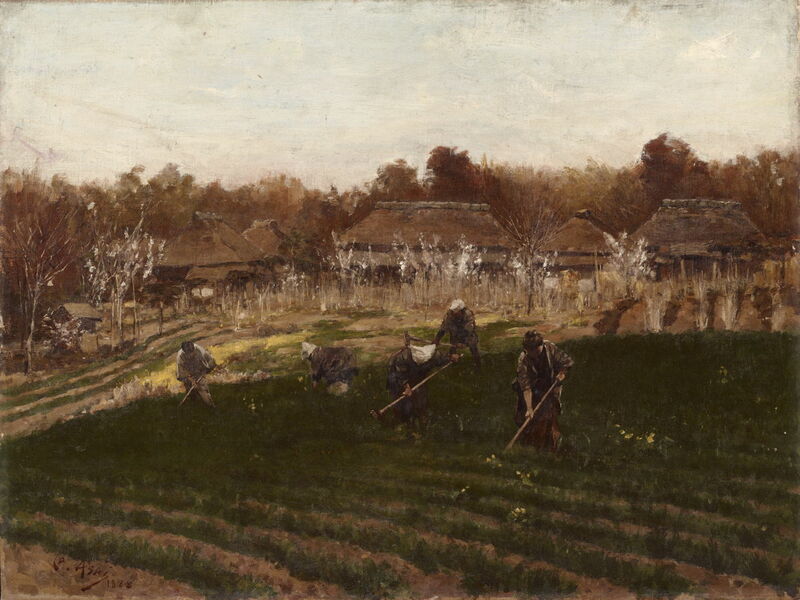 Asai Chū’s Spring Ridge 春畝 浅井忠筆 (1889) shows a gang at work in a field at the start of the growing season. 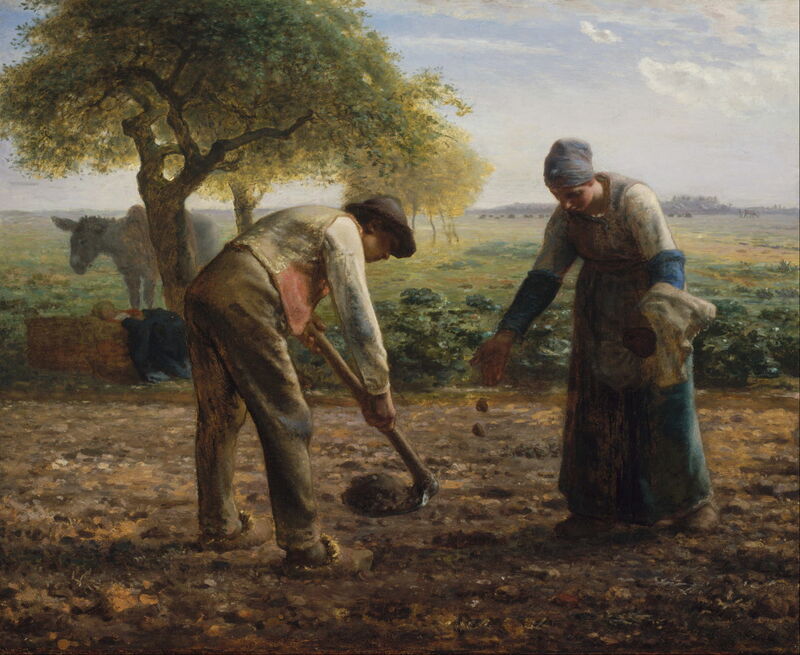 For staple root-crops, such as potatoes, this practice was widespread, and a popular subject for social realist artists in the middle of the nineteenth century. Jean-François Millet (1814–1875), Potato Planters (c 1861), oil on canvas, 82.5 x 101.3 cm, Museum of Fine Arts Boston, Boston, MA. Wikimedia Commons. Most of those left in the country were condemned to working from dawn to dusk in a back-breaking effort to save themselves from starvation. 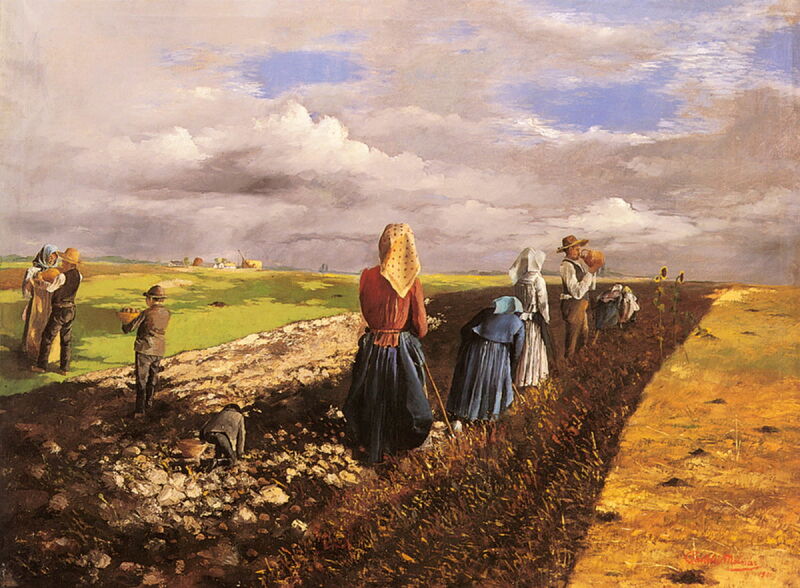 Jean-François Millet and others showed this more accurate picture in Potato Planters (c 1861). Jules Bastien-Lepage (1848–1884), October: Potato Gatherers (1878), oil on canvas, 180.7 x 196 cm, National Gallery of Victoria, Melbourne. Wikimedia Commons. 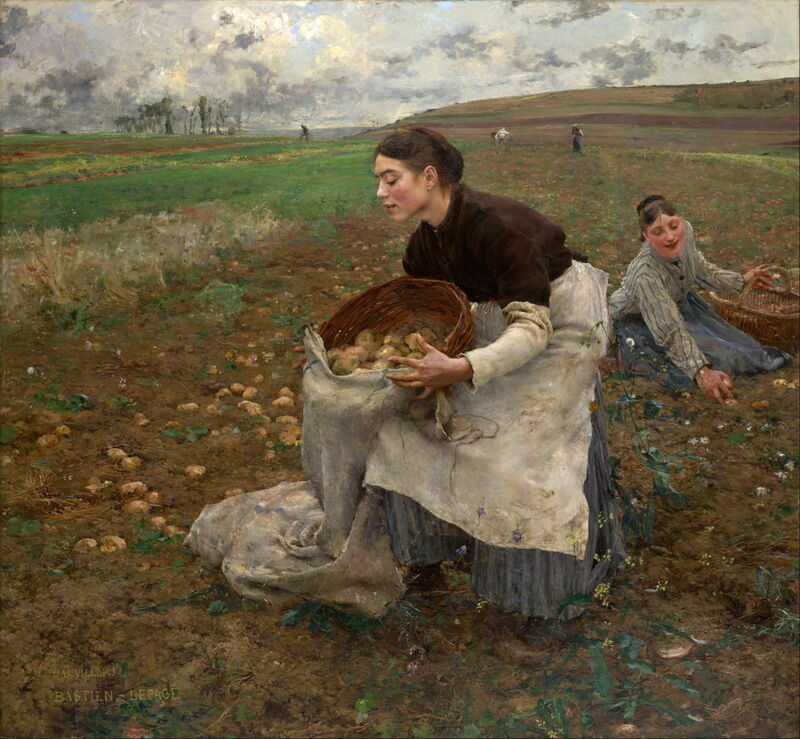 What was sown or planted then has to be harvested, as in Jules Bastien-Lepage’s October: Potato Gatherers (1878). Although there are still smiles, those potatoes were all that kept those families from starvation through the coming winter. Vincent van Gogh (1853–1890), Woman Lifting Potatoes (1885), oil on canvas, dimensions not known, Van Gogh Museum, Amsterdam. Wikimedia Commons. Vincent van Gogh painted Woman Lifting Potatoes (1885) and similar scenes during his time in Nuenen, in North Brabant. János Pentelei Molnár (1878–1924), The Potato Harvest (1901), oil on canvas, 79 x 109 cm, Private collection. Wikimedia Commons. János Pentelei Molnár’s The Potato Harvest (1901) takes this on into the early years of the twentieth century, in Hungary. 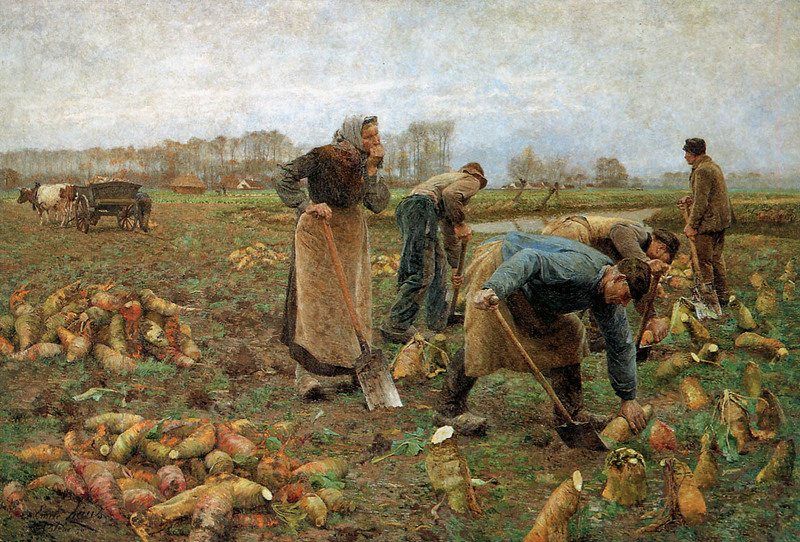 Across Europe, different crops brought similar scenes: here is Émile Claus’s The Beet Harvest (1890) in Belgium. 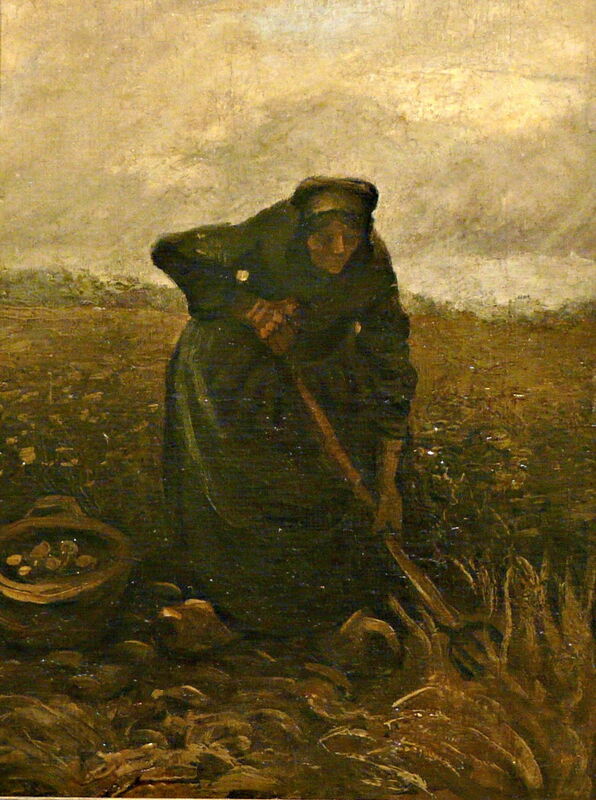 Leon Wyczółkowski (1852–1936), Beetroot Digging II (1911), oil on canvas, 64 × 78.5 cm, Muzeum Narodowe w Warszawie, Warsaw, Poland. Wikimedia Commons. 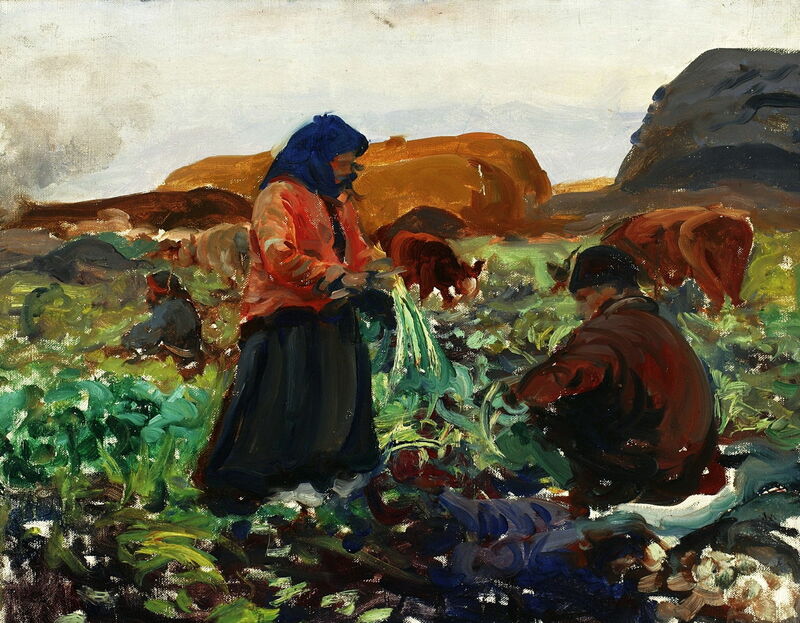 Leon Wyczółkowski’s Beetroot Digging II (1911) shows a similar scene in Poland, before the First World War. If the flower garden was the place for social gatherings and relationships, more everyday events occurred among the cabbages. Jean-François Millet (1814–1875), First Steps (c 1858), black Conté crayon on paper, 32 × 43 cm, Lauren Rogers Museum of Art, Laurel, MS. Wikimedia Commons. Jean-François Millet’s First Steps (c 1858) shows one of the early milestones in a child’s life, as an infant is about to break free from mother’s arms and walk for the first time towards their father’s. 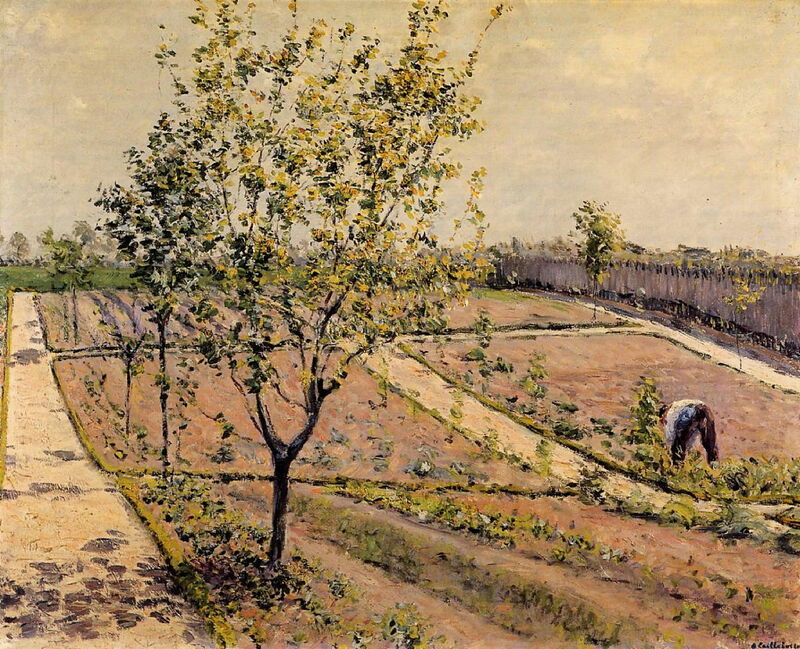 Aimé Perret (1847–1927), The Lettuce Patch (1893), oil on canvas, 46 x 56 cm, location not known. Wikimedia Commons. The vegetable garden is also where we learn much about life – about the birds and the bees, of cabbages and kings. 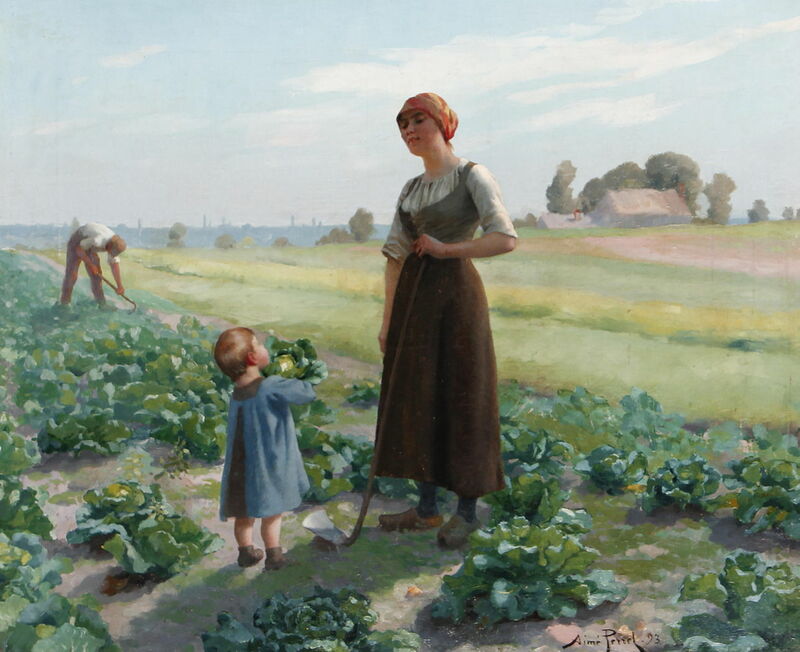 Aimé Perret captures this beautifully in her The Lettuce Patch (1893). 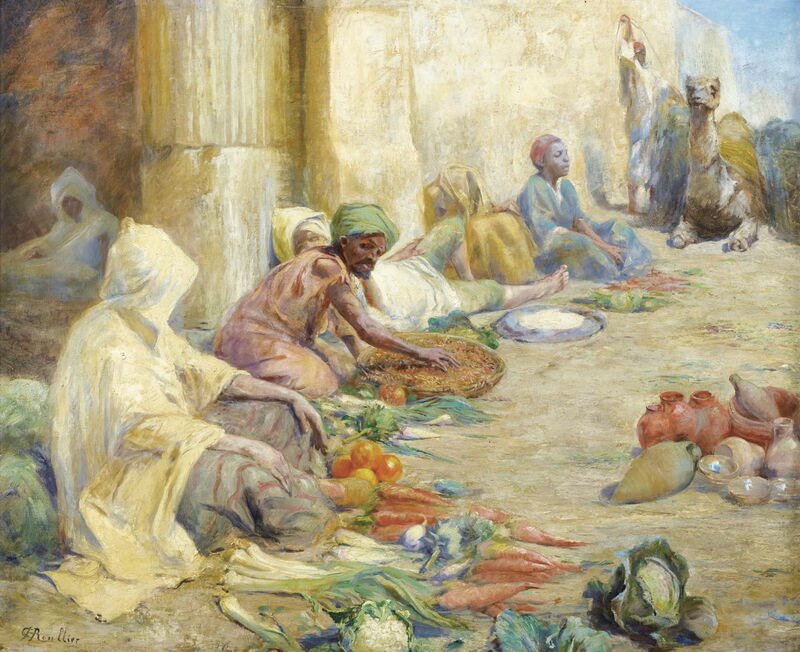 Christian Henri Roullier (1845-1926), The Vegetable Souk (date not known), oil on canvas, 81.5 × 100.5 cm, location not known. Wikimedia Commons. The vegetables which are surplus can also be sold on at a market. There are many paintings of conventional European markets, but none is a match for Christian Henri Roullier’s The Vegetable Souk, from the early twentieth century. 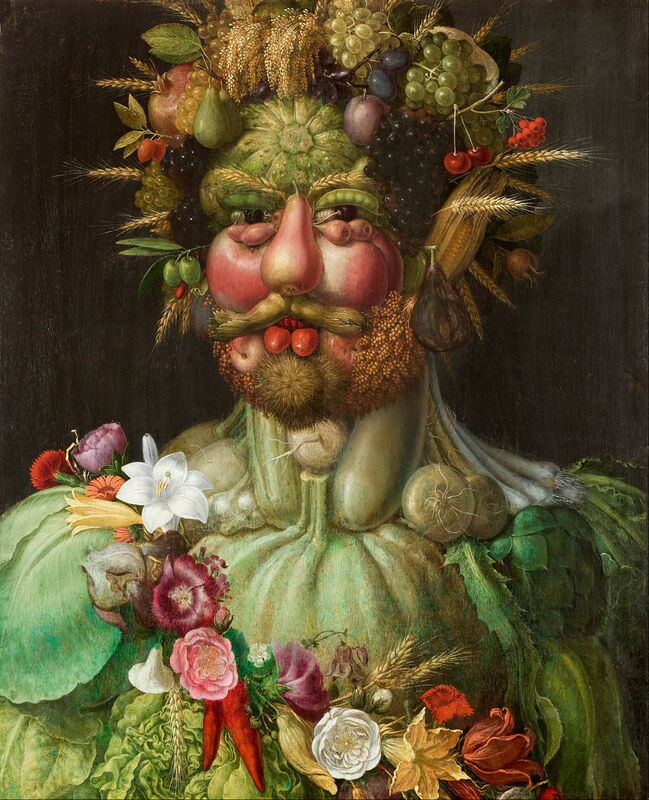 No article about vegetables and paintings can conclude without at least one of Arcimboldo’s unique portraits. 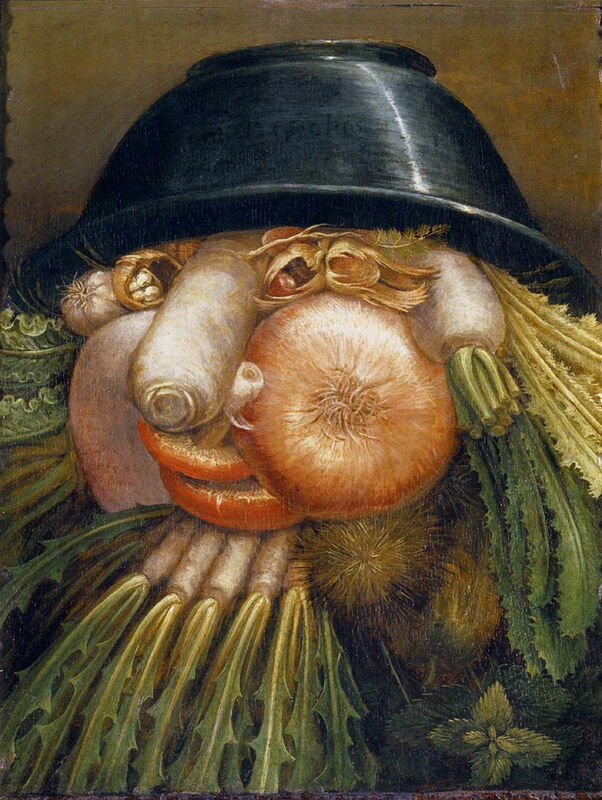 This is perhaps his most famous, but he also made a painting which is even more relevant to this article: The Vegetable Gardener (1587-90). Giuseppe Arcimboldo (1527–1593), The Vegetable Gardener (1587-90), oil on panel, 36 x 24 cm, Museo Civico “Ala Ponzone”, Cremona, Italy. Wikimedia Commons. Which all goes to show that we are what we eat. Posted in General, Painting and tagged Arcimboldo, Astrup, Bastien-Lepage, Caillebotte, Chu, Clausen, Crivelli, garden, Impressionism, Millet, Molnár, painting, Perret, Rouiller, Schindler, Sisley, van Gogh, vegetables, Wyczółkowski. Bookmark the permalink.